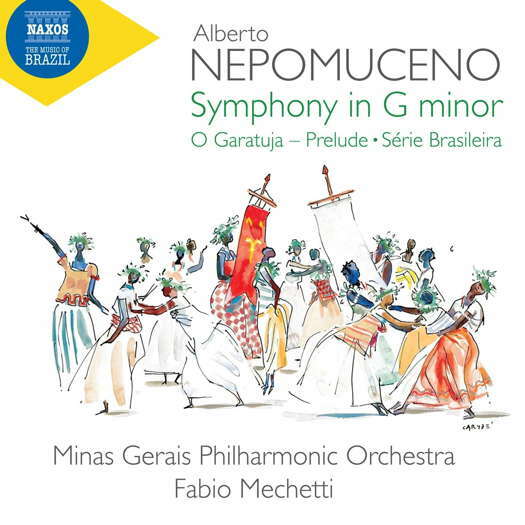 In February 2019 Naxos Records released Symphony in G minor and other orchestral works by Brazilian composer Alberto Nepomuceno, performed by the Minas Gerais Philharmonic Orchestra under the baton of Fabio Mechetti. This release (8.574067) marks the start of an ambitious project, Brasil em Concerto, developed by the Brazilian Ministry of Foreign Affairs, promoting music by Brazilian composers dating back to the eighteenth century. The series will see Naxos release one hundred orchestral works from nineteenth and twentieth century Brazilian composers over the next few years, performed by the São Paulo Symphony Orchestra, the Minas Gerais Symphony Orchestra and the Goiás Philharmonic Orchestra, as well as a selection of vocal and chamber music. Most of the works recorded for the series have never had recordings available outside Brazil; many others will have their world premiere recordings. An important part of the project is the preparation of new or even first editions of the works to be recorded, many of which, despite their relevance, have only been available in the composer's manuscript. This work will be carried out by the Brazilian Academy of Music and by musicologists working together with the orchestras. Alberto Nepomuceno (1864-1920) was a herald of Brazilian musical nationalism. He was one of the first composers in his country to employ elements of folklore in his compositions, he encouraged younger composers such as Villa-Lobos, and his music was conducted by Richard Strauss. The Prelude to O Garatuja, an incomplete opera, is one of his best-known works and an example of a truly Brazilian lyric comedy. Série Brasileira is a vivacious suite that employs maxixe rhythms and ends with the feverish batuque dance, while the Symphony in G minor is one of the earliest such examples by a Brazilian, a heroic and lyric structure revealing the influence of Brahms. Brazilian conductor Fabio Mechetti was appointed Music Director and Principal Conductor of the Minas Gerais Philharmonic Orchestra in 2008. He is also currently Music Director Emeritus of the Jacksonville Symphony. Mechetti has appeared as guest conductor with orchestras such as the Seattle, Rome and BBC Scottish Symphony orchestras, the Buffalo and Rochester Philharmonic Orchestras, and various orchestras in Mexico, Spain, Brazil and Venezuela. Winner of Denmark's Malko Competition in 1989, Mechetti served as resident conductor of the San Diego Symphony in 1986 and associate conductor of the National Symphony Orchestra from 1985 to 1989. Mechetti has Master's degrees in both conducting and composition from Juilliard. The Minas Gerais Philharmonic Orchestra was created in 2008 in order to promote orchestral music in Brazil and abroad. The orchestra comprises ninety musicians from all over Brazil, Europe, Asia and the Americas, and has received the Concerto Magazine Award in 2015, the Carlos Gomes Award for Best Brazilian Orchestra in 2012, and was named Best Classical Music Ensemble of the Year by the São Paulo Association of Art Critics (APCA) in 2010. In 2009, Music Director and Principal Conductor Fabio Mechetti was honoured with the Carlos Gomes Award for Best Brazilian Conductor. The orchestra takes pride in its commitment to fostering Brazilian talent, commissioning new music every season and hosting annual workshops for young conductors and composers. Launched in 1987 and offering over 10,000 titles, Naxos Records is the world's leading classical music label in terms of number of new releases and breadth of catalogue. Its strategy of recording exciting new repertoire with exceptional talent has been recognised with numerous Grammy awards, Penguin Guide 3 star recommendations, Gramophone Editor's Choice Awards, ICMA awards and other honours. Naxos is a truly international label and produces over two hundred new recordings a year in more than thirty countries. The second release in this series will feature Sonatas by Leopoldo Miguez and Glauco Velasquez, performed by violinist Emmanuele Baldini and pianist Karin Fernandes. Naxos plans to release the album in September 2019. 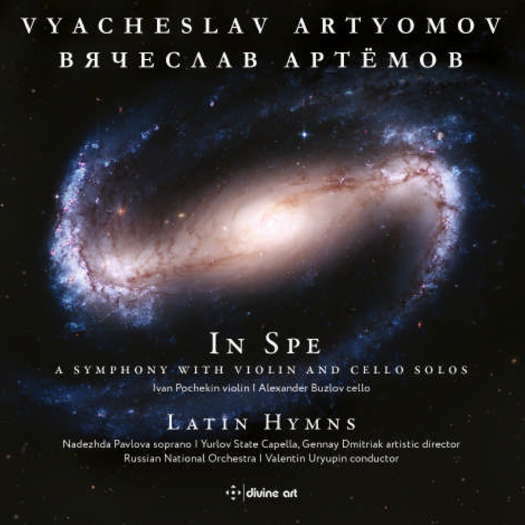 Divine Art's new releases in April 2019 include Vyacheslav Artyomov's massive Symphony 'in Spe' and gorgeous Latin Hymns (DDA 25184); the first volume in a projected series of the complete Harpsichord Suites by J J Froberger performed by Gilbert Rowland (Athene ATH 23204); 'Mdina': Music for Horn - a varied programme of mainstream and contemporary works, given by principal horn of the Malta Philharmonic, Etienne Cutajar ((Divine Art DDA 25189); and 'Refracted Resonance' (Métier MSV 28586): a collection of very new works for guitar performed by Sam Cave, a leading specialist in this field. All titles will be available from Divine Art’s own online store in CD and digital album formats, and from all good dealers in CD format, digital download and streaming audio. Vyacheslav Artyomov is considered by many to be Russia’s greatest living composer, but his highly distinctive work has only recently become better known to an international audience. The tenth title in Divine Art's Artyomov retrospective features two works recorded in 2018. The massive symphony 'In spe' (2014) has its origins in a 1993 invitation for Artyomov to write a cello concerto for Mstislav Rostropovich. In the process of writing, Artyomov found he wanted to add a violin soloist, and it became a symphony with concertante violin and cello, breaking new ground in his writing in its use of polydynamic, ever changing textures. Latin Hymns presents four sacred texts in the most virtuosic writing for choir and soloist, not only prayers to the Virgin Mary but recreating her persona in music. It features a stunning performance by soprano Nadezhda Pavlova. 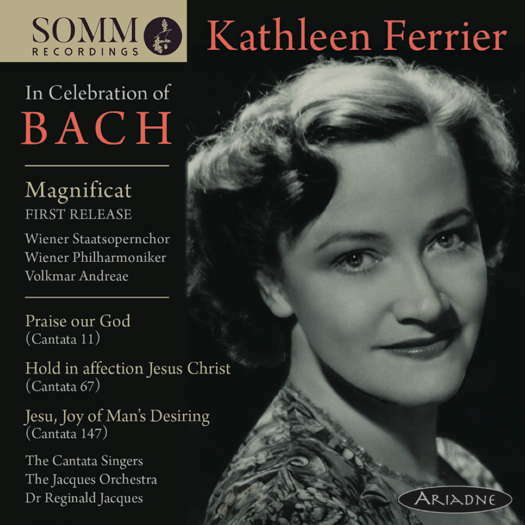 SOMM Recordings' two releases for April 2019 are: Kathleen Ferrier: In Celebration of Bach, a collection of historic performances including the first appearance on disc of Ferrier singing in Bach's Magnificat, with the Vienna Philharmonic conducted by Volkmar Andreae in the Grosser Musikvereinssaal, from the legendary 1950 International Bach Festival (Ariadne 5004) and Colour and Light: 20th-Century British Piano Music with pianist Nathan Williamson - a century-spanning programme from Delius' quixotic 1887 Nocturne to Anthony Herschel Hill's combustible Toccata of 1985 (SOMM Céleste 0196). After two years of development, including adventurous, public rehearsals, German composer and pianist Martin Kohlstedt is set to release a bold, improvisational collaboration with the seventy-person GewandhausChor - Leipzig's renowned 150-year old choir - entitled Ströme (Currents). Kohlstedt has released two solo piano albums: Tag (2012) and Nacht (2014), and in 2017 he released his third recording, Strom, which also features electronic instrumentation. Ströme is the latest refinement of a Kohlstedt snapshot. On this album, Martin Kohlstedt's modular compositions - not 'works' as such, but rather compendiums of interconnecting musical ideas - once again break new terrain. Kohlstedt resonates with the choir, and above all with its director Gregor Meyer, sparking emotional impulses between the singers and indirectly stimulating movement in their bodies. As participants in this experiment, the members of the GewandhausChor adopted innovative musical methods, not working from traditional notation. Each singer was free to take individual creative initiatives. A wealth of patience was required on both sides and a fundamental tension courses through all the recordings, which draw to electrifying effect on modules from previous albums. Martin Kohlstedt is known for music that exercises a magnetic power, and here it draws performers and listeners into a field of social warmth, of intimate negotiation, of breaking away and coming together. 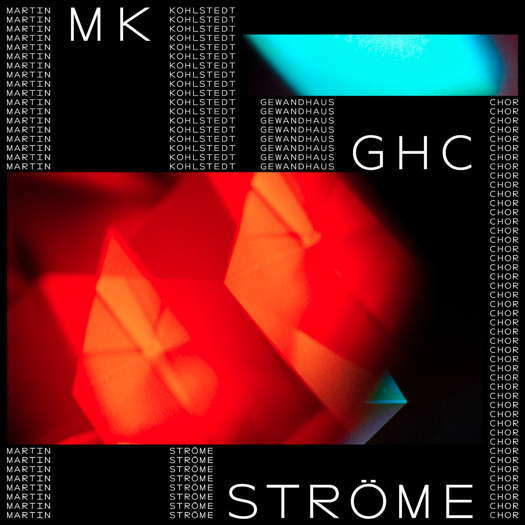 With Ströme, Martin Kohlstedt leaves us in no doubt as to the power that lies in the presence of real, live performers. As they strive for a shared sensibility, they become a ceremonial community that subsumes the listener. This makes Ströme into an almost archaic, but highly energetic phenomenon. It is also daring, in that it pulls off the masterstroke of making a classically trained chorus fundamental to Kohlstedt's free association. Everybody involved is pushed to their limits and this is precisely what makes the instrumental and vocal elements meld time and again into something that is both elevated and eternally new. The eight tracks, all featuring the GewandhausChor, have the following six-letter names SENIMB, TARLEH, AUHEJA, NIODOM, KSYCHA, JINGOL, THIPHY and AMSOMB.